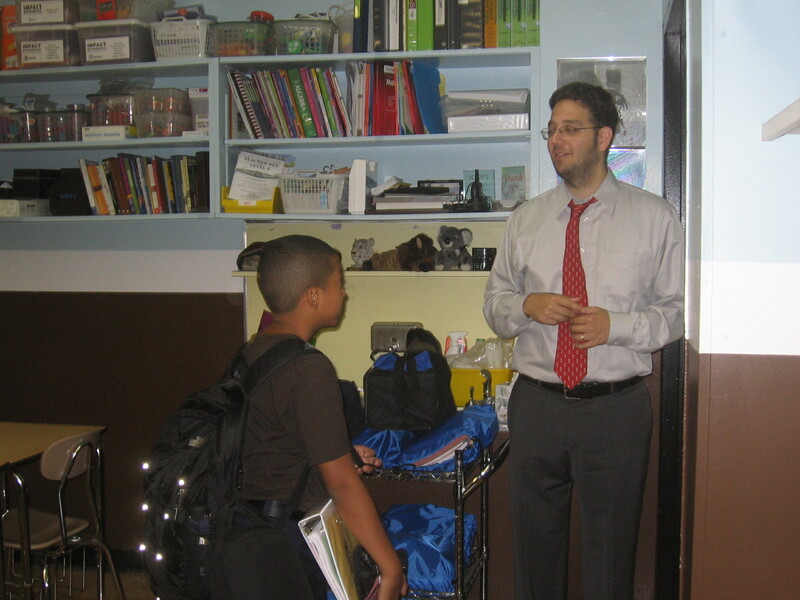 Last week, I visited KIPP Infinity Middle School, my first day-long visit to a charter school. I picked the school because I was told that KIPP Infinity, which is located opposite the M.T.A.’s Manhattanville bus depot on 133rd Street in Harlem, had solved one of the thorniest problems dogging charter schools—high turnover among teachers. One of many criticisms leveled at charter schools, most of which are not unionized, is that teachers suffer burnout because of the tough workloads. Indeed, most charter schools keep much longer hours than do traditional public schools. KIPP-affiliated schools, for example, typically start at 7:30 and don’t end until 5 p.m., at which point teachers still need to grade homework and finish preparing for the following day. Saturday school adds another half-day to the work week. And charter schools, typically, have a longer school year with some mandatory summer classes. Joseph Negron, the founding principal of KIPP Infinity, which opened its doors in 2005, addressed the burnout problem head on. Negron, who recently resigned as principal to return to teaching–also at KIPP Infinity– shortened the school day by an hour, moving dismissal to 4 p.m from 5 p.m. He juggled the Saturday schedule so teachers would only have to teach three or four Saturdays per semester. And he allowed teachers to come in late one morning per week. “The most important thing is hiring and retaining great staff,” says Negron. On the day of my visit, I arrive at 7:25, in time for morning meeting in the school auditorium, and am met by Peter Croncota, the director of operations, who hands me a schedule of classes and invites me to drop in on any class I wish to see. I begin with Negron’s fifth grade computation class—all fifth graders get two periods of math each day, one to bolster their computation skills and the other to work on problem-solving. There are 40 students in each computation class—by far the largest class at KIPP Infinity. Negron then asks the class to estimate the answer by rounding each number to the nearest 100. Then to the nearest ten. One child offers: 290 plus 440. A few hands point to 440. Most kids point to 290. “Since the two numbers are in the thousands, can we round to the nearest thousand?” asks the boy. The entire class moves its arms in jerky motions. Giggles break the silence. “Just ‘cause I had 10s and 100s in the earlier problem, if you have a number that goes out to the thousands, check out how easy that is. BAM: 2000, BAM: 5,000. That’s the point of estimating. CLAP CLAP, clap, clap, clap. Negron beats out a rhythm. CLAP CLAP, clap, clap clap, responds the class. “I try to get them through the most passive parts of the lesson,” explains Negron who uses a whole repertoire of clapping and chanting rituals in his class. Negron once had every teacher follow the schedule of a child from the time he woke up at home until he left the school in the late afternoon. It was “much harder” being a kid and sitting through a typical KIPP day than the teachers had thought, explains Negron. The upshot was more time for movement, socializing and more frequent bathroom breaks. Back in his computation class, virtually every student appears to be on task. A dozen hands pop up every time Negron asks a question. “Sit up,” Negron admonishes one child when he starts to slouch. Only one boy sits hunched over, his head bowed, not participating. He doesn’t respond to questions. He doesn’t clap. The boy snaps his pencil in two. “I am super frustrated Manuel*,” Negron finally says to the boy in front of the class. “You are too old for this. I’m just being honest. At KIPP there is no tolerance for defiance. Students attend summer classes to learn the rules, which include—sitting up straight, responding politely to both teachers and students, handing homework in promptly. KIPP uses a paycheck system to reward and punish students. To earn privileges, including the right to wear a shirt with the KIPP logo as well as year-end trips to New England and Utah, kids need to maintain a $40 average in their paycheck accounts; each student starts the week with $70 in his paycheck. Small infractions, like calling out when it’s not your turn, get deductions of $3. Missing homework gets bigger deductions. Manuel’s act of rebellion, I later learn, zeroed out his account for the week. In the eighth grade hall, Jeff Li and Gerard Griffith, share a classroom with a basketball hoop in one corner. 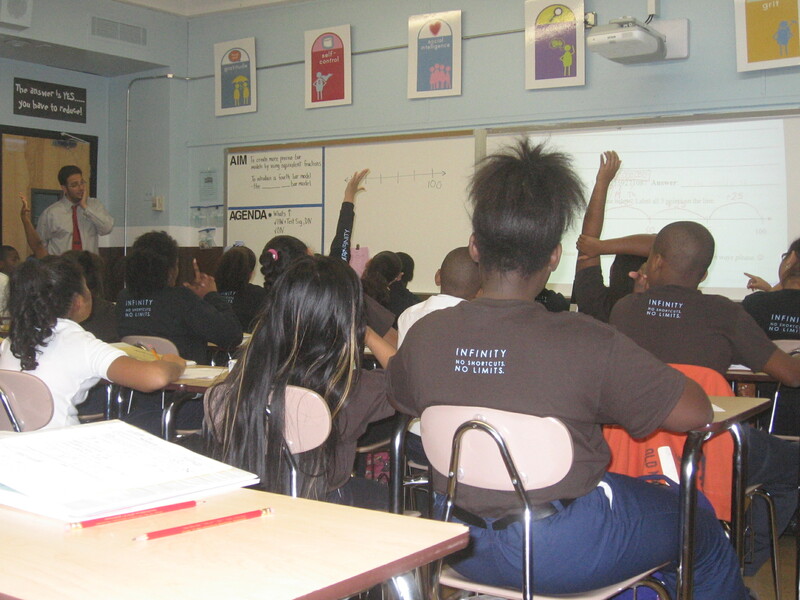 Li, who is Asian and served as co-principal of KIPP AMP, a charter school in Brooklyn, is teaching math. At the end of class, he gives his students a few minutes to shoot hoops. After math, Griffith, who is also a KIPP Infinity veteran and African American, begins a history lesson, starting with key vocabulary words and phrases. The class discusses civil disobedience, desegregation, popular sovereignty. Eventually they get to “secession”. Griffith loads a Youtube video onto the whiteboard. The screen shows the rapper and professional wrestler R. Truth (aka Ron Killings) wearing a grey confederate uniform, wielding a sword and marching down one aisle of a crowded arena. Inside the ring are a wrestler and Vince McMahon, CEO of World Wrestling Entertainment (WWE). The on-screen crowd boos loudly. The KIPP kids chuckle. “What’s ironic about the uniform that R. Truth is wearing,” Griffith asks his class. “You can say it,” encourages Griffith. “Because he’s black, and that’s a confederate uniform,” calls out one student. R. Truth’s performance will not be his last on WWE. Nor are the KIPP Infinity students likely to forget the definition of secession. 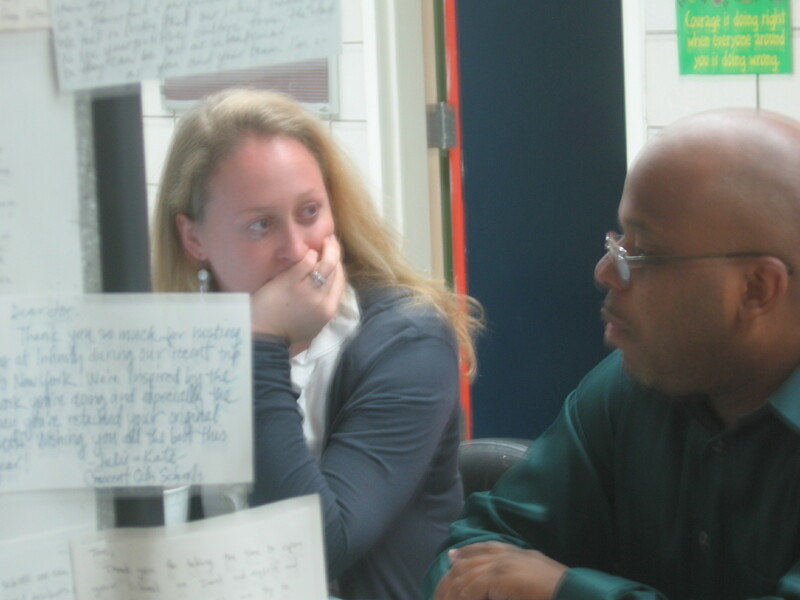 The teaching styles of KIPP Infinity teachers are as diverse as the faculty itself. “We want to make sure that as much as possible that the teachers reflect the background of our kids,” says Negron. Virtually all KIPP Infinity students are black and Latino. About 90 percent are poor enough to be eligible for free or reduced-price lunch. The vast majority of teachers hired at KIPP Infinity already have several years experience under their belts. Once they get here, few of them leave. The turnover rate for teachers with fewer than five years of experience was just 14 percent in 2009/10 school year, the last year for which statistics are available, down from 27 percent two years earlier. A glance through an old yearbook shows that many of the current teachers also appeared in the 2009 edition. But many have taken on new duties. Indeed, in addition to holding on to its teachers, KIPP Infinity seems to have tackled another key management challenge—succession planning. When Negron decided to return to his first love—teaching–he identified Allison Willis Holley, a long-time non-fiction studies teacher at the school to succeed him. Holley has continued to tweak the teacher schedule, still with a view to avoiding teacher burnout. She has extended the school day to 5 p.m. for kids who need extra help with reading, and is introducing a new reading enrichment program that she hopes will bolster literacy as the school where math scores consistently outpace student performance on ELA. In exchange, she has eliminated Saturday school entirely. In 2011, 41 percent of KIPP Infinity students received 3s or 4s, the top two scores, in the state English tests while close to 84 percent scored 3s and 4s in math. Roughly 10 percent of KIPP students are held back each year. I wondered what would happen to a defiant child like Manuel, who is new at the school this year and who is having trouble adapting. After my first day at KIPP, the one conclusion I could draw was that KIPP Inifinity non-participation is not an option. *I have changed the name of the student to protect his identity. Please stay tuned for an upcoming conversation with a KIPP Infinity parent on KIPP curriculum, discipline and raising kids in Harlem. Are we to think that shaming students in front of their peers constitutes a “laboratory of innovation,” and is a model for schools elsewhere, or is it instead part of the training and behavior modification that poor and minority children are to receive, in order to prepare them for the authoritarian workplaces they are being groomed to work passively and unquestioningly in? Leonie–Thanks for your question. Regarding teacher turnover: According to the school’s report card on the nysed.gov website, the turnover rate for teachers with less than 5 years of experience was 14% in the 2009/2010 school year, down from 27% two years earlier. For teachers with more than 5 years experience turnover was 21% for both those years. Of course, when you click on the schools report card site, nysed.gov posts the following disclaimer “The site you are about to visit may not be under the jurisdiction of the New York City Department of Education and thus the Department may not be responsible for its content.” However, during my random walk through the school, I spoke to about a dozen teachers–one-third of the teaching force–and only one of those had less than three years at the school. The question of student attrition is trickier. If you look at the same report card, the class sizes drop a little every year. In 2009/2010, the lowest drop was between Grade 6 and 7 of just over 3%; the highest drop was between Grade 9 and 10 of almost 20%. CORRECTION: I made an error in the student enrollment data, in answer to Leonie’s question. The changes between grade levels from 2008/2009 school year to the 2009/2010 school year are actually much smaller than I had originally indicated. For example, the fifth grade class in 2008/2009 has 81 students, but the sixth grade class in 2009/2010 (presumably the same class a year later) has 79 students–about a six percent drop. By contrast, the eighth grade class of 2008/2009 has 57 students, while the next year’s ninth grade class has 61 students, i.e. an increase of about 7 percent. This data alone isn’t enough to draw conclusions about student attrition. We’d need to know how many new students are admitted each year. How many old students leave etc. I am a KIPP parent and I would like to know if there is any news for the current year, 2014-2015 for students coming in from KIPP elementary? I have a few problems with KIPP schools as a whole. I also have a child that graduated from KIPP college Prep.